Product page eF-GD-80-VL | E2M Technologies B.V. The eF-GD-80-VL control loader is a compact and scalable geared-drive for primary- and secondary controls for Flight Training Devices (FTD). Allows E2M to use a smaller servo drive compared to our standard geared eForce control loaders, resulting in lower costs. These systems offer sufficient force and velocity for typical FTD applications. These value line units are delivered with the same software features as the level D capable units for pilot simulation. Over 20 years of electrical- and hydraulic Control Loading experience and type specific modelling experience of over 30 different types of fixed and rotary wing aircrafts, influenced the development of the new eF-GD-80-VL value line control loader. 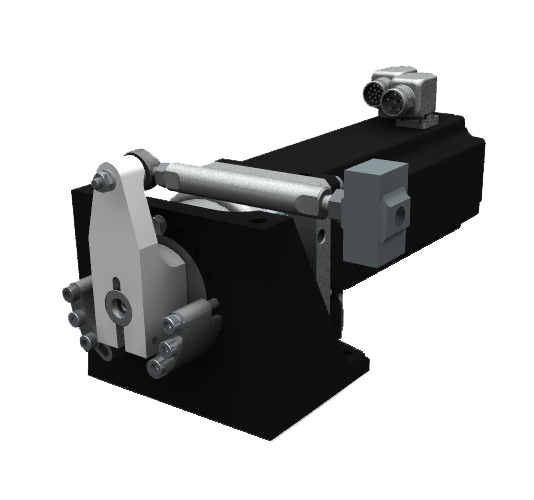 The system architecture is derived from the reliable, proven and robust eF-GD-120 control loader and scaled down by the use of smaller, less powerful components that made it possible to lower the production costs of the actuator. Ask the E2M sales team what it would mean to use these units in your simulator. The eDeveloper API (E2M Development Environment) is a software tool that allows the customer to develop their own type-specific software model. This option facilitates customers having sufficient knowledge about control loading software models and able to customize the generic model in order to replicate the behaviour of the simulated aircraft. The eMoveRT controller is a common software platform for all control systems of E2M. Real Time-Linux/Xenomai is used as the operation system. industry standard hardware is used: Ethernet hardware for communications, a commercial of the shelf industrial PC for the control software.